Well, I suppose this page is for those 'older' folk who remember (or may have since forgotton) some of the earlier happenings around the estate where many were considered normal 'day to day' events. The Coley Gardeners Association was formed in 1948 to represent allotment holders. An 'allotment' being a small area of land, let out at a nominal yearly rent by the local government or independent allotment associations, for individuals to grow their own food. The Association was affiliated to the Reading Horticultural Federation. Between 1948 and 1960, the Association committee generally met at the Brickmakers Arms on Wolseley Street (closed in 1959). Formal occasions such as the AGM and lectures were usually held at St Saviour’s Church Hall. The Association was wound up in 1960 following the use of the allotment site for housing by the Reading Corporation (RBC). These allotments referred to those that existed on the land south of St. Saviours Road (across the road from the Coley Recreation Park) and between the Holy Brook. These allotments were replaced with a new allotment site located south of Lesford Road in Coley Park, adjacent to the Holy Brook, which still exists today. Read more HERE at the Reading Allotments website. Before they were gobbled up by housing and schools, there were plenty of open spaces and woodlands to explore. Huge trees, some hundreds of years old were scattered around the estate. When the original Coley Park Primary School was built in the 1960's a number of notable trees were cut down, including a huge red beech tree, a cherry tree and number of horse-chestnut trees that were always an attraction around 'conker' season (Conkers is a children's game using the large seeds of the horse-chestnut tree). Another notable tree was another large red beech tree which stood where the Coley Park Community Centre stands today. One tree that held special attention was known locally as the 'Hollow Tree'. This old oak had been struck by lightning at some time in its past and the centre and part of its trunk was destroyed by fire. But the tree survived and still kept a good coverage of branches. The hollow part started about 2 metres above ground level, but one could easily climb up and into the hollow which made a great cubby house for the local kids. The older teenage children always managed to hang a rope from one of the sturdy branches to make a swing, which sometimes had only a knot to sit on, or on occassion it had a plank or old care tyre. Besides climbing trees you could build wicked cubby houses in the thick undergrowth, or play endless games of hide and seek dodging the stinging nettles, or just have endless fun trying to get the conkers down from a huge horse-chestnut tree nearest to the allotment gardens. The fields were always abundant with buttercups and daises in late spring and sprang to life with butterflies over summer. Before the Ice-Cream vans patrolled the streets and usually during the warmer summer days there was an old chap who would walk the streets of Coley Park estate and sell Walls ice-creams from a small white push cart. He would stop for ages near the bus terminus by the high-rise flats on Wensley Road. My favourite was called Four Feather Falls, an ice cream based on the 1960 animated puppet TV show created by Gerry Anderson. I never did know his name or where he came from. Eventually, the colourful Ice Cream vans infiltrated the streets with their monotonous tunes rousing the street as they vied for customers throughout the estate. In mid-summer there could be up to three vans on the estate at the same time - even packed one behind the other! The kids of course, just loved them. The main contenders were Tonibell and Mr Whippy. Tonibell vans were a sky blue colour and had the cow symbol on the front. They gave away free collector cards of movie stars etc. and sometimes included a voucher for a free ice-cream on their next visit. If you were really lucky, dad would buy the big block of ice-cream which came in a cardboard box container known as a 'brick' for having after the Sunday dinner. Before the row of five shops were built on Wensley Road in 1961, the next nearest shops were on Berkeley Avenue or over at the Southcote Estate. This then gave an opportunity for mobile traders to visit the estate and sell their wares direct. There was of course the milkman who did a daily round with his electric milk float, and the baker's van which delivered fresh bread and rolls. A chap named 'Charlie' drove the big blue Grocery van which carried all sorts of household and grocery items (remember the free plastic flower with every packet of DAZ washing powder), and on Friday morning the fishmonger who sold fresh fish from the back of his small van did his rounds. They had all but disappeared by the mid 1960's as most residents travelled into town to get cheaper groceries from places like the Co-op and Tescos. 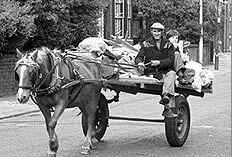 The occasional visit of the 'Rag and Bone' man attracted children like flies to follow his horse and cart as it made its way around the estate. His call was something similar to "rag-and-bone", delivered in a sing-song fashion but usually ended up sounding more like "raa-boh". He would collect old rags and newspapers, (for converting into fabric and paper), bones for making glue, scrap iron and other items, often trading them for other items of limited value, like a goldfish in a small bag of water (which was totally useless unless you had a fish tank and the fish usually had a very limited life span ... not to mention Mum who frowned at the sight of another fish to look after). Once the world became more mechanised, some rag-and-bone men traded their horses for a lorry or pickup van. Other social changes, such as the tendency for all members of a household to work outside the house, not to mention higher levels of traffic, made casual street-by-street pickup unworkable. ... there was a regular collection of kitchen food scraps such as vegetable and fruit peelings, not to mention unused breads, cakes or biscuits. The local Coley Park farm provided metal bins to households on the estate, known as 'pig bins'. These were collected weekly and provided additional feed for pigs at that time - a practice since banned for health reasons. Believe it or not, the local constabulary once provided policemen on foot or bicycle to make regular patrols of the Coley Park estate (among other places), and you came to be on first name terms with the local plod (for good reasons). A clip around the ear for scrumping apples was about all the trouble the kids got into in those days. There were of course occasions of more hardened activities, like burglaries and assault, but they were definately in the minority in those early days. There were no mobile cell phones in those days, so the local bobby would have to check back with 'central' by using a small phone box situated on the corner of Wensley and Lesford Roads opposite the old mansion. It was also for use by the general public to call Police, Fire or Ambulance in an emergency as most homes did not have their own telephone in those days. There was always a number of false alarms where some not-so-smart kid thought it would be fun to place a prank call (seems nothing has changed there over the years). And finally to disappoint all you Doctor Who fans, no it wasn't like the Tardis-type box unfortunately, but much smaller and similar to the call box in the photo. Most days living on the estate are usually uneventful, but the collision of two light planes over the water meadows at Coley Park was the talk of the street for many years and here we recap on the events of that tragic Sunday afternoon. It was a clear sunny Sunday afternoon on November 4th 1962 and two small light aircraft were enjoying the airspace above the lush green fields located between Coley Park and Whitley. This was a popular area or airspace for small aircraft during their training or just for practice. On this day as it was on most Sundays in summer, numerous light planes were heard or seen in the area. Both planes involved, a DeHavilland Chipmunk and a Beagle Terrier, had taken off earlier from the popular White Waltham airfield located just west of Maidenhead. Over the Coley Park fields they were reportedly seen doing aerobatics and at one time looked like they were having a mock-up dog fight. A witness on the ground said that, "All of a sudden there was an explosion like a can of petrol exploding and bits of aircraft started to drift towards the ground. It seems that one plane ran into the rear of the other." Many local residents from Coley Park and also nearby fishermen ran towards the burning wreckage as quickly as possible. At the risk of being burnt themselves, they cut the pilots' straps and pulled both pilots free. One of the pilot’s uniform was on fire and the local rescuers put out the flames. Unfortunately their efforts were in vain as the man died shortly after in their arms. The collision was seen and heard from miles around as calls to the police and firemen at Reading were received at an alarming rate. The initial reports said the crash was over Southcote which caused a slight delay in arriving at the scene, but the firefighters could do very little to save anyone. 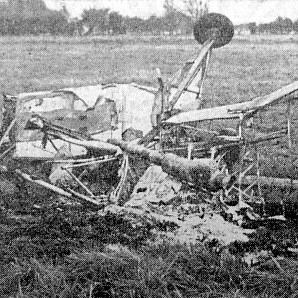 Some of the witness information in this acticle was retrieved from the Evening Standard newsaper which reported that five people died in this accident, but reports from locals at the time indicated there was only one pilot in each plane and both died from their injuries after the impact with the ground. On a happier note, remember when you could sit on the steps of the Coley Branch footbridge and watch the trains come and go. It was always a great vantage point for trainspotters or just a relaxing stop on your way to somewhere else. Prior to 1965 a signalbox was located nearby from which could be heard the 'ringing' of the bells when another train was entering the section. First it was steam trains and then came the diesels, and today the high speed trains speed their way through Southcote Junction with their complement of passengers. The young 'trainspotters' of yesteryear have been a little thin on the ground in recent years, but there seems to be a swing back again. There is enormous interest around both the modern and preserved railways and this can be witnessed by the ever-increasing number of railway preservation sites around the United Kingdom. 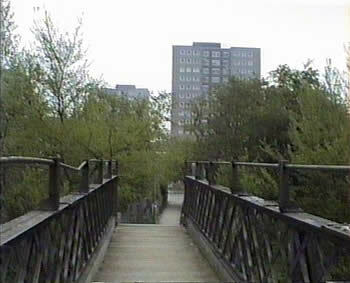 The photo shows the old iron footbridge that was once a favourite vantage point for 'trainspotters'. Sadly it was removed in April 2001 as deemed unsafe and no longer had any practicable use as the branch line it once crossed over had long closed.